It is known that the Spanish brought good horses to North, Central and South America and were breeding them in the Caribbean from the early 1500s. Some were leopard. But the numbers simply don't compute. How could these Spanish horses survive and reproduce fast enough to spread all the way to Canada and across the Rocky Mountains in just 200 years? Faced with predators such as grizzlies, wolves and cougars, poisonous snakes, alligators, swamps, deserts, blood-sucking insects, competition from other herbivores such as vast herds of bison, and the harsh climate of North America, such a rapid expansion of numbers and territory seems hard to imagine. But what if there were other horses added to what the Spanish brought? For the Nez Perce Appaloosas to look different from the common Spanish Mustangs, and for the number of leopard horses to be so great, there had to be another source of horses. According to Nez Perce oral tradition, Russian traders brought spotted horses to the coast of Oregon in the 1600s. If the Russians had simply purchased Spanish horses fin California, the horses should have looked like the Spanish horses that spread from the southeast — but they didn't. In the 1940s, a Blackfoot man named Shaved Head told ethnologist John C. Ewers that his tribe got their horses long ago from the Nez Perce in Oregon, who told him that they had “taken their horses out of the water”. Perhaps that meant some of their original animals came from a coastal shipwreck or from a seafaring trader. They were known as Ghost Horses or Ghost Wind Horses. They were said to do a running walk and rack, possessed incredible stamina, toughness and beauty and were primarily leopards and few-spot leopards. These Russian horses were believed to be a mix of Akhal-Teke (which sometimes pace) and spotted horses from the Don region of Russia, once occupied by the Mongols, who had leopard horses. Leopard also is one of the known colours in the Altai, a horse breed from southern Siberia. If the tale is true, this would certainly increase the percentage of animals carrying the leopard gene in the American northwest. It also might explain how the western herds grew so large from a relatively small stock of Spanish horses, why the Nez Perce horses included so many leopards when the colour was rare east of the Rocky Mountains and why the best of the Nez Perce had such different conformation from the traditional Mustangs. In 1877, Chief Joseph of the Nez Perce led about 750 of his people and 3,000 horses (about half of them Appaloosas) 1,300 miles north to Canada to avoid confinement on a government reservation. Their Appaloosas kept them ahead of the American cavalry, whose horses were much inferior. The people stopped to rest, thinking they were safely in Canada, but in fact they were still forty miles short of their destination. American soldiers caught them and sent back to Idaho. The government promptly confiscated the Appaloosa horses and either shot them or bred them to draught horses to ensure there would not be another uprising. Fortunately, area ranchers knew the value of the Appaloosa horses and were able to obtain a few, and some Native people who were not part of the flight managed to hang onto their spotted horses. Many were crossed with spotted Spanish Mustangs to create excellent ranch horses. In 1938, a club was formed to restore the breed. There were few true Appaloosas left, so the new Appaloosa registry permitted crossing with Arabians, Quarter Horses and Thoroughbred to reduce the influence of the draught horse crosses. But what began as a temporary measure continued for decades. By the 1990s, many “Appaloosas” had very little Appaloosa blood and looked like Quarter Horses or Thoroughbreds with a few, or no, spots. Clearly, something had to be done to save the brightly-marked leopard horses. Some breeders who believed this outcrossing was destroying the original Appaloosa set out to breed only Appaloosa to Appaloosa with little or no outcrossing. They found that leopard bred to leopard produced a much higher percentage of spotted foals with all the other Appaloosa characteristics: striped hoofs, white eye sclera and spotted skin. And the colours were eye-popping. Even the mares, traditionally less colourful, had big, bright spots. Many of them were Indian Shufflers, doing a natural lateral ambling gait inherited from distant Spanish Jennet and possibly from Akhal-Teke ancestors. Some of the early breeders best known for concentrating the leopard colour in their herds were Money Creek Ranch (based on the stallion Pepper's Shamrock), Timberline Stock Ranch (Navajo's Candy), Don Ulrich (Ulrich's Many Coups), Dan Morgan (Morgan's Leopard) and the many “Sundance 500” breeders whose herds were based on the descendants of the red leopard stallion Sundance, whose registration number with the Appaloosa club was F-500. 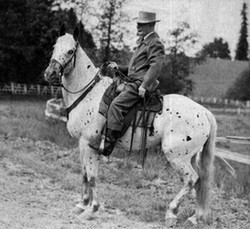 At his American Leopard Horse Ranch in Michigan, the late Frank Scripter spent three decades breeding only leopard horses descended from the original Nez Perce stock of the mid-1800s. Selecting for working ability and soundness as well as colour, he succeeded in creating a pure strain of leopard Appaloosas which he called American Leopards. His foundation stallion Chub's Powderface was well known both amongst Appaloosa and American Leopard horse fanciers. Some horses from the Scripter bloodlines have nothing but leopard Appaloosas in their pedigrees for 10 generations. Some are so heavily spotted that the spots are crowded up against each other. Today, there are still ranches continuing these breeding programs and preserving these and other old leopard Appaloosa bloodlines. Many are involved with the Foundation Appaloosa Horse Registry, created in 1998 by the late Tom Taylor (who passed away in February 2013) to preserve the original Appaloosa type and bloodlines. In an article in Appaloosa News in June 1969, author Mary Hare said that there was a line of leopards that originally came from Utah and were unrelated to the Nez Perce Appaloosas. They had been in the Davidson family in Utah since the 1870s, and their original leopards had been caught from wild herds in the San Raphael Swell area in eastern Utah. People in the area called these leopard horses San Rafael horses. According to an article by Utah writer Kerry Ross Borden, in 1540, a Scotsman named Thomas Blake was in command of a small party of Spaniards, part of an expedition by Francisco Coronado travelling north from Mexico, when he and his men entered what is now Utah. They had many horses with them, including what Borden calls “mottled-white mares and stallions, descendants of the Cortez Moorish strain”. The small party was defeated by the Utes, who kept the white horses with mottled spots for themselves and then escorted Blake and the Spaniards out of their territory. Unfortunately, the website where this information was found is no longer available. Apparently the Utes became quite enthralled with the mottled horses. 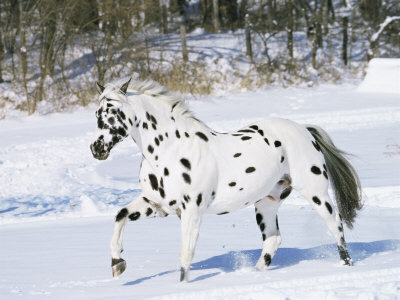 Over the next century, they made efforts to obtain as many horses as possible, with the focus being on spotted horses. Inevitably, many horses escaped, and by the 1800s there were large herds of the spotted white horses running wild on the San Raphael Swell. All were considered the property of Chief Walkara (called Walker by Europeans) until he died in 1855. When the Mormons arrived in Utah, many tried to capture the wild horses. The Meek family reportedly were quite successful and sold one of their spotted stallions to the outlaw Butch Cassidy, who named the horse Mine Guard (also known as the Cassity or Cassidy Leopard). In the late 1870s, Cassidy's friend, Amasa Davidson, captured a blue-spotted leopard stallion and named him King of the Mountain. These two stallions eventually led to the creation of a herd of domestic spotted white horses owned by the Davidson family. Amasa Davidson (who had moved to Wyoming from Utah) bred a daughter of King of the Mountain to the Cassidy horse, and the result was a red leopard stallion he called Prince of the Mountain. Prince then sired a magnificent black leopard stallion foaled 1913. Descended from a horse owned by Butch Cassidy, whose companion in crime was The Sundance Kid, the young stallion was named The Kid. Davidson planned to use him as his future herd sire, but fate intervened. In 1916, The Kid was stolen by a local boy, who ran off with him. A huge $1,000 reward, later increased to $1,500, was offered for the horse's return. Davidson spent two years looking for him, and discovered that The Kid and the young thief had ended up in Wyoming, where the thief lost The Kid in a poker game. One man managed to obtain The Kid and was taking him back to collect the reward when he got jumped by outlaws, who took the horse. After that, The Kid's trail went cold. Davidson was devastated. Somehow, The Kid ended up back in Cheyenne in the winter of 1917-18, where he was left behind at a livery stable when his rider couldn't pay for the horse's board. The stallion was sold by the stable owner to another man for the rent owed, then he was sold to John Starbuck. The horse became known as Starbuck Leopard, and became a foundation sire of leopard Appaloosa horses and grandsire of Sundance F-500. Was there added significance to the name Sundance? Did Starbuck know or suspect that his leopard horse was The Kid? Starbuck Leopard died around 1939. Thirty years later, author Mary Hare wrote an article called “Accent On Spots” which was published in Appaloosa News with a photo of Starbuck Leopard. Amasa's grandson Arlin Davidson of Sandy, Utah, saw the article and photo and recognised The Kid from the many family photos he had seen. Arlin showed the article and photo to his father (who was in his 80s) and other older folk who had known the horse. None had ever heard of Starbuck Leopard, but they all recognized the horse immediately. It was The Kid. The mystery was solved. The Appaloosa complex was less common in Spanish-speaking Central and South America, possibly because tastes for coloured horses had waned over time. For centuries, spotted horses were sold or traded north into the United States. The one exception was Argentina, polo capital of the world, where leopards remained both common and popular, since they made good polo ponies. Appaloosa-marked horses were being imported from Argentina to the United States by the start of the 20th century. This practice of importing Argentine Leopard horses was still occurring as recently as 1962, when Ben Burnside imported more than 40 Argentine Appaloosas, most of them leopard, to Louisiana. One of the most famous of these Argentine imports was the national champion performance stallion Burnside's David M.
Carson & Barnes Circus leopard horse, 1919. This circus had 6 Appaloosas. Circuses have long used leopard horses in liberty, dressage, and other acts. Traditionally, circus liberty horses of any origin were billed as Libyan Leopards, Moroccan Leopards, Spotted Arabians, African Barbs and other exotic names. Many had pedigrees and most were probably Danish Knabstruppers, but two world wars in Europe created havoc with many breeds, and circus owners scrambled just to save their animals. A number of these circuses moved to America, some before 1900 but many more afterward. Some of the leopard circus horses ended up in California movie studios and with wealthy California businessmen, who also had imported spotted polo ponies from Argentina. They were all mixed together with spotted horses shipped in from Utah, and when the Appaloosa registry was created, many of these animals were registered as Appaloosa despite having little or no blood relationship to the spotted Nez Perce horses. Regardless, the mix of bloodlines was quite successful. Leopard circus horses had an impact elsewhere in America, too. Many of the liberty and “high school” (circus dressage) acts used stallions. The famous blanket Appaloosa stallion Wapiti, born in 1955, was a seventh-generation descendant of an Appaloosa stallion called Arab, bred by Coke Roberds in Trinidad, Colorado. Arab, born around 1888, was sired by a black leopard circus horse while the circus was spending the winter in Trinidad. There were twelve Appaloosas in a liberty horse act that toured with the Barnes Circus in 1914, and circus riders Ella and Fred Bradna and Fred Derrick used Appaloosas when they toured with Barnum and Bailey and later Ringling Brothers. American circus high school rider Georgia Sweet, who performed with the Cole Bros. Circus among others, was pictured in 1952 riding a leopard horse trained by Jorgen Christiansen. In the end, the result of mixing all these different horses with the bright leopard coats was a colourful, intelligent, sensible and versatile type of horse. Today, American Leopards excel in jumping, dressage, cross-country, racing, ranch work, rodeo and even in driving trials in harness. If you want to learn more about Appaloosas, here are some books you might like. A rare and exceptional breed, the Appaloosa became legendary as the horse of the Nez Perce Indians. Unique in beauty and character, the Appaloosa comes alive in this dazzling book. Immigration pretty much always involves many different expeditions. The Altai link is very interesting, but I suggest that the ancestors of the Amerindians did not migrate in one expedition, but filtered across over generations. This is a great read. I hadn't heard of the small region of Altai, home of the Altai horse, until very recently. By some very strange coincidence genetic testing of the skeleton of a Native American infant, who died several thousand years ago, provided geneticists with the clearest evidence yet available of the genetic origin of our Native American ancestors..... the Altai region. It's amazing that our Native American ancestors chose to walk from Altai rather than ride on their Altai horses?